I get anxious and I sweat. My heart gives me palpitations. My legs and hands start shaking. This is me when confronted by heights. Not a good feeling, huh? I have spent so much time in the air that one would think I am a pro. Well, I am not. I don’t know about you, but when I fly, all I do is sleep, watch movies, feel uncomfortable, and… count down to when I finally land and put my feet on the ground. I admit it—I am afraid of heights. Very much afraid, I have to say. Is this going to stop me? You see, if there is one thing that is very much a trait of mine, it is that I don’t let any of my limits interfere with my life. 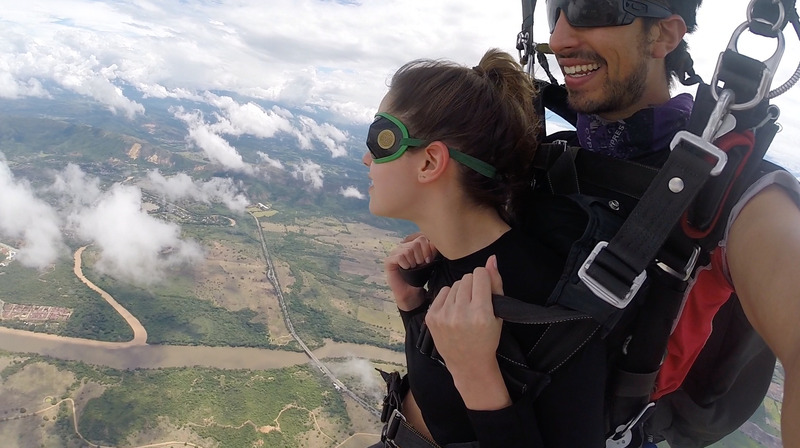 So when I decided to give my boyfriend a skydiving experience (I know! what a good unselfish girlfriend I am!) as a present for his birthday, I took the chance as a serious challenge for me to battle this fear of mine. 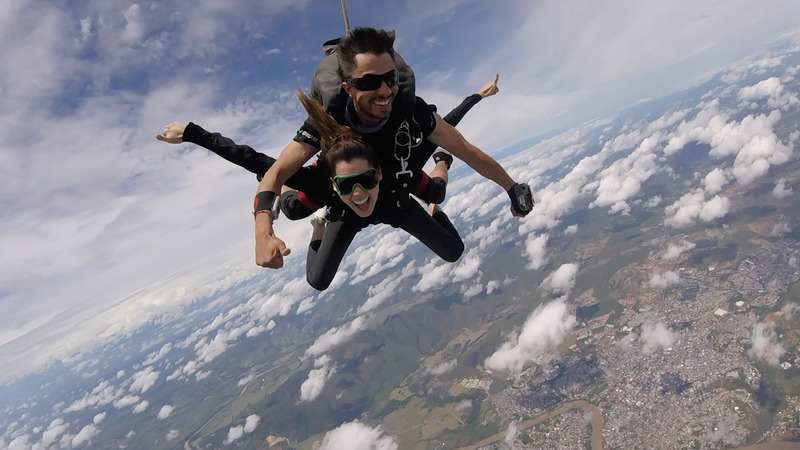 Also, skydiving had been on my wish list for a long time, so it couldn’t wait any longer! It was Paulina vs Fear of heights. Let’s see who came out as the champion! The chosen place was right outside of Bogotà, in my own Colombia, in a small village called Anapoima. A dear friend of mine, Eduardo, had highly recommended it. The instructor there had been skydiving something like 24 thousand times, so I was feeling safe. As we were getting ready to go, I noticed one thing: the plane didn’t have a door. Which I guess makes a lot of sense, since the entire purpose is to jump, not to sit and relax. But let’s go back to the story. The door-less plane took off. We were up in the air and going very fast. And then the time came. I was standing there, looking at my adventure’s companions. Right in the eyes. One by one, off they were. It was too late to go somewhere else. I remember thinking that my options were very limited at that point. I was feeling pretty cocky, until the last ten seconds when you have to sit on the edge of the plane. Then, all of a sudden, calm took over. I was ready for what was about to happen. And it did happened. Super fast, perhaps too fast. Anywhere between three and five seconds of panic and then I did it. I jumped. I couldn’t breathe. It was a weirdly scary feeling that quickly changed into feeling awesome. I was free. It was a different kind of free. Not just mentally, but physically and emotionally too. I was in the air, floating and precipitating voraciously towards the earth. My eyes, which I had closed right before jumping, were now open and what I was seeing was immense and not totally comprehensible. There is nothing more rewarding than getting out of your comfort zone and achieving something that doesn’t come easy, like throwing yourself from a parachute when you are afraid of heights. Or maybe speaking in public when you are shy, or asking for a favor of someone who you know will most probably say no. You still have to try. More than heights, what I am really afraid of is getting old and looking back at my life with regrets. Regrets of not taking risks, not having the courage to challenge myself, or not changing and evolving overtime. Putting myself out there and seeing what happens means everything to me. Life can surprise you! Maybe your life will change forever and for good the day that you decide to give it a chance to pursue a dream, a job, a career, a relationship, or a sport. Anything! The worst thing you can do in life is not try. Cada palabra la sentí real, me llevo de esta lectura un grana aprendizaje y guia, soy de esas personas que se creen soñadoras, pero en realidad le temo a la mayoría de mis pensamientos, gracias por inspirar desde la experiencia. sigue adelante, seré una fiel lectora de tu blog. Se ve que eres una mujer decidida a mi también me gustaría vivir esa experiencia. That’s somthing I being wanting to do it’s been a great sopport from all of you in social to be able to comment and speak freely I guess I just need guidance people to show me where or how I start my way to see if I can.